The Tribe of Ku-Ni-Eh The Tribe of Ku-ni-eh was a very widespread honor camper society that was in existence from the Great Lakes area to the Gulf of Mexico to the Atlantic coastal states. It was created in 1922 in the Cincinnati Area Council in Ohio by Arthur E. Roberts, their Scout Executive and camp director. He had been looking for a program to keep older boys interested in scouting and found it within the Kankau, a tribe of the Maidu Indians of Northern California. The Tribe of Ku-ni-eh was based at Camp Edgar Friedlander in Ohio. The symbol of the society was the "We-Hin-Ah-Pay" (means rising sun) which was a design taken from the base of the Maidu Indian ceremonial basket of the same name. Ku-Ni-Eh means "Order of Manhood". It was a Maidu Indian ceremony that was a rite of passage from boy to man and tested the youth in virtues neccesary to become a brave. A Ku-ni-eh handbook from 1923 is known to exist and a ceremonial manual was published and copyrighted by Arthur Roberts in 1926. * Bob Walton wrote to us and noted "The tribe of Ku-Ni-Eh was used as a camp honor society at Camp Kilodeska, Cape Fear Area Council, Wilmington, NC in 1936, 37& 38. It was also used, by the council, at Camp Singletary in 1939. I have not found any reference to Ku-Ni-Eh after 1939." An outline of the Tribe of Ku-ni-eh that was written in the 1940's states that the Tribe was active in Ohio, Kentucky, Tennessee, Virginia, West Virginia, North Carolina, South Carolina, southern Indiana and Illinois. Which specific councils within those states was not mentioned. The list didn't mention the states of Wisconsin and Texas which had numerous councils using the Ku-ni-eh program. Loyalty to the Ideals of Scouting. Orderliness and neatness of person, tent and camp. Advancement in the program of Scoutcraft. General out of doors knowledge; Helpfulness towards new boys. Participation in construction and sanitation. Cheerfulness in service and discipline. Unlike the OA which has members of a scout's troop choose who will be selected to join, candidates for Ku-ni-eh were selected by Tribe members. The 1923 handbook details the procedure as follows: "At the end of each camping session at which the tribe is represented, all of the available members assemble at a time which is appointed by Mishenewa. With the sponsor present, recommendation for tribal membership is made by any member for any camper. Each candidate is discussed by each tribal member. When a candidate has been considered by everyone, he is then voted upon in an open ballot and those who receive a unanimous vote are accepted for the Tribe." The Nine Laws of Ku-Ni-Eh. A Ku-Ni-Eh brave tries to gain and keep perfect health. A Ku-Ni-Eh brave controls himself. A Ku-Ni-Eh is reliable and trustworthy. A Ku-Ni-Eh observes the rules of Clean Play. A Ku-Ni-Eh is a good workman. *The name Miami was substituted with the name of a local body of water nearest the particular Tribe. In the Firelands Council it was Lake Erie. Miami was used by the original Tribe in Cincinnati. An account of the ordeal and ceremony in the Comanche Trail Council in Texas stated that candidates had an arrow scratched into their arm with a needle and they were given an arrow shaft and told to make a completed arrow with their name on it. It was placed in a quiver with the other member's arrows. If they disgraced the scouting ideals their arrow was shot into the air. If they could not find it they were out of the society. In Comanche Trail, candidates were awakened at midnight and were roped together and hiked until dawn blindfolded. They then made their breakfast then took a bath in a tank of cold water. Later they worked throughout the day to complete their ordeal. It was not unusual to wake up in the morning and find your tentmate missing and he would be gone for three days. He would return as a member of the Tribe of Ku-Ni-Eh. It was introduced in Comanche Trail after a local scout became a member of the society at the scout camp in Waco, Texas (Heart O' Texas Council) and brought it back with him. Entry into Ku-Ni-Eh was a three day process and the ceremonial script was eight typed pages. Some of the main Indian characters in the Ku-Ni-Eh ceremonial were Mishenewa (the friend brave) (spelled Mishenowa in the handbook), Go-wa-na (the father brave), Tah-ko-dah (the Tribe Chief), Fire-builder and Ka-wi-da (the wise brave). The handbook also names "Wenidi", (the story teller brave). Based on information in the ceremonial book there was an overnight time where candidates were kept together in a general area. Each was given a small leaflet with the laws and song of Ku-Ni-Eh printed on it. They were sent off to seek solitude and to study the information on the leaflet before meeting the chief the next day. If they met another candidate in the forest they were they were to remain silent, give the sign of frienship and pass on. There were two passwords that they had to learn; the first was "Service" and the second was "Prepared". Members were given the Ku-ni-eh badge as well as a Ku-ni-eh handbook which had on the back cover the statement: "The holding of this handbook asserts that___________ is a member of the Tribe of Ku-ni-eh." 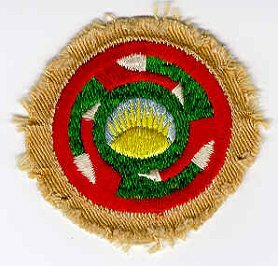 Ku-Ni-Eh did have a national membership badge (patch). "Badges in wholesale lots of 39 dozen may be secured from Lion Brothers of Baltimore. Small quantities may be secured from Cincinnati Scout Headquarters at cost and mail. The badges are silk embroidered, similar to merit badges and same size..." (quoted from the 1926 ceremonial book). The size of the square cloth was about the same as merit badges back then but the embroidered circle was silver dollar size. 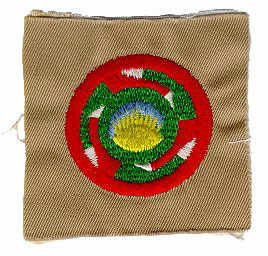 Sometimes the square was cut down to round as was done with the square merit badges. The early patch was chain stitch embroidered on felt and the later version was embroidered on twill material. Apparently when the program reached the Comanche Trail Council in Texas in 1935, the fact that there was a national patch was unknown to them. 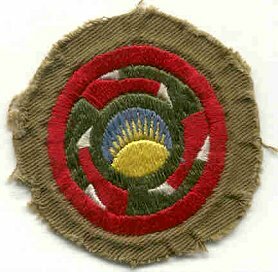 They created their own local Ku-ni-eh patch which was a square leather fringed patch with Indian markings on it. In the Otena Lodge 295 history it states that there was no national Ku-ni-eh patch even though there was. An explaination of the national badge design was given in the 1923 handbook which states: "We take the sun for our symbol and guide because it meant to the Indian honor and fidelity, it gives light and warmth, it chases away the shadows and the gloom. It follows a straight course through the skies and is never swayed from it's purpose. Be like the sun. Find out that which is good and hold fast to it. Remember the story of the hound and the stag; lack of imagination led him from a real goal to a lesser and lesser one until he got off track completely. The sun teaches us to pick our objective and follow a straight course toward the goal. About the sun is the blue sky of the morning when all things begin anew. Green like nature in springtime means blossoming manhood. White is for purity. Red is for health, virility, and the heart from which issues life. Whenever you look upon this symbol, renew your vows to Ku-ni-eh. To be a true member of this Tribe and loyal to it's teachings will insure fair weather to you throughout life." A Ku-ni-eh monument was erected at Camp Offutt in Versailles, Kentucky which was the camp of the Blue Grass Council. The camp existed from 1923 to 1960. The monument listed all of the members of the local Tribe of Ku-ni-eh from 1927-1943. I am told that the monument still exists to this day. The totem (the Ku-ni-eh patch on top) was poured and painted concrete. The totem was removed from its engraved limestone base in 1960 when the camp closed and it was remounted on top of another stone structure at the OA ceremony grounds at McKee Scout Reservation in Mount Sterling, KY. Over the years the Kunieh symbol deteriorated, and eventually was removed. It's pieces have survived and they have been put back together in a frame, something like a large jig saw puzzle weighing between 50-100 pounds. The tapered limestone base portion of the monument (with the names of all of the Ku-Ni-Eh members of that time) is still at old Camp Offutt. The new owners of the camp felt that it should stay a part of the place and it has for all of these years. The first name that was inscribed on the monument was O.C. Rankin who was the "sponsor" of the Blue Grass Council Tribe of Ku-ni-eh. He was inducted into the society at Camp Friedlander in Cincinnati and is believed to be the person who brought Ku-ni-eh to Kentucky and promoted it. He agressively resisted the OA replacing Ku-ni-eh and never joined the Kawida OA lodge. He died in 1969. I was told by a member of Kawida lodge that even after the OA lodge was started in 1952 the Ku-ni-eh continued to induct members and give out the membership patch. This went on into the 1960's. There are still many councils who have lost track of what honor society/programs they had before the OA (if any). I suspect there are a few out there that had Ku-Ni-Eh that have yet to rediscover it. The society no longer exists but there still is a Ku-Ni-Eh OA Lodge 145 in Ohio and their flaps still include the We-Hin-Ah-Pay (Rising Sun) within their design. Kawida OA Lodge 480 in Kentucky took their lodge name directly from one of the Indian braves in the Ku-ni-eh ceremonial. Information and scans provided by Tim Brown, Jack Simon, Joe Foxhuber, Paul Myers, and Bill Topkis.